Bosnia-Herzegovina has lost three consecutive friendly matches, and in the last two we haven’t even scored. For an attacking team that earned a reputation for “scoring goals for fun” in the World Cup qualifications, this is worrying. Our latest loss came yesterday in a friendly against Egypt, in front of a large Bosnian crowd who quickly realized what they were witnessing wasn’t worth coming out for. The loss itself isn’t as important—it is a friendly after all—as is the manner in which we lost. Once again coach Safet Susic has not learned from past tactical mistakes, he has not listened to legitimate criticism, and once again we have put on a truly lethargic and embarrassing display far below what our team is capable of. Most of our starting players play for clubs in the top five leagues, but you wouldn’t know it by today’s performances. We were outplayed by players who mostly play in Egypt. Players who wanted to prove themselves. Players who had a coach with a solid game plan. I would call yesterday’s formation bad, but it’s hard to even know what the formation was; players were running all over the pitch, out of position and getting caught out by the Egyptians on the counter attack. It was just one big mess that was painful to watch. Susic could have done something about this at half time, like any competent manager would, but instead our team came out for the second half with no real tactical changes and played even worse. Susic continues to face every opponent—be they minnows or world champions—with the same4-4-2 formation and two striker system that has backfired on us almost every time we have faced quality teams. Something has to change soon or we are not going to win any games in Brazil. Susic refuses to go back to the 4-2-3-1 formation we used with great success in the past. With that formation and Dzeko as the lone striker, Bosnia outplayed France in Paris in the last Euro qualifiers and put on one of our best performances of the last two decades. Certainly the best under Susic. That game eventually ended 1-1 when France equalized with a shady penalty, but it didn’t matter, our players made us proud. Fast forward a few years, and we’re losing 2-0 against Egypt and can’t score at home against Slovakia. The two new players, Anel Hadzic and Tino-Sven Susic, who were chosen by Susic as the solution to our defensive midfield problem, were useless defensively. If anything, we were more exposed in this friendly than we were in any match in recent memory. Tino can hardly be blamed for his poor defensive display; as Blaz Sliskovic pointed out, he is more an attacking midfielder and not suited for defending. Safet Susic doesn’t seem to understand this. Tino worked hard, wanted to prove himself worthy of the call up, and he may have a place on this team, but not as a defensive midfielder. Hadzic is a patriotic kid who you can’t help but like, but it would be a gross understatement to say that today was not the positive debut we were hoping for. He was a non-factor. I’m sorry to say I was right when I said that he simply does not have the quality to be a starter at the World Cup. “There will be those who are angry and disappointed but the competition in our squad has increased, and we have two new players (Hadzic and Tino) who regardless of tonight’s defeat have shown that they can be counted on in the future”. If it wasn’t for this beard I’m sporting right now, my jaw would have shattered when it hit the floor. The only player who can cure our defensive midfield headache is Muhamed Besic, a young talent who has already proven himself against quality opposition like Mexico and Brazil. 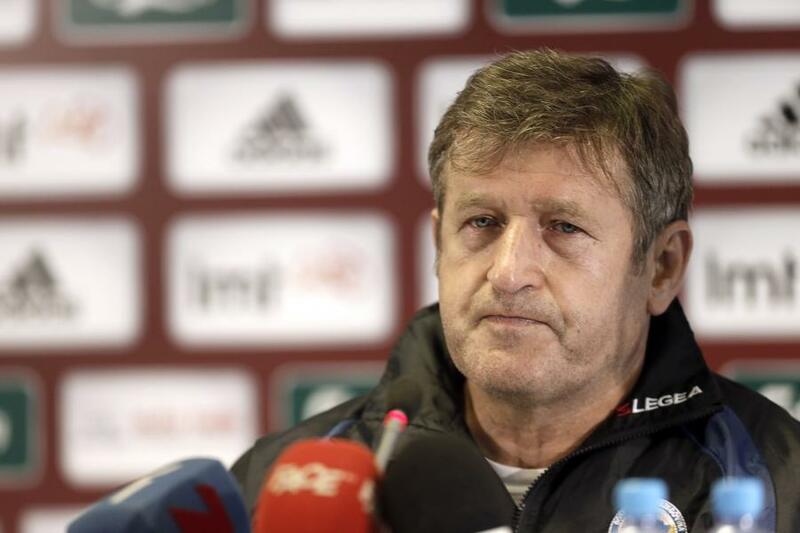 Susic, however, has not shown any signs of calling him up. His neglect of Besic is becoming absurd at this point. I could understand it if we already had other quality players to replace him, but we don’t. We are desperate. Susic doesn’t seem to care. I should also add that even Sejad Salihovic, whose magnificent recent displays for Hoffenheim saw him listed as one of WhoScored’s top 20 players of the month, and who has been very consistent for his club this season, was absolutely terrible today when Susic got his hands on him. That says a lot. Kolasinac and Lulic were the only players to put in a real shift, with Kolasinac in particular once again showing what a talent he is. By far the most bizarre moment of the match came in the second half. In the 63rd minute, Susic decided to take out the more active Ibisevic, and leave Dzeko on. Edin was clearly struggling and it wouldn’t be an exaggeration to say this was one of the worst games he’s ever had for the national team. At one point, Dzeko even went to ground with an injury and asked to be subbed off but Susic did nothing(!?). Turns out he was injured even before the match started and was only supposed to play one half but for whatever reason, Susic changed his mind and forced him to play the full 90. Dzeko is the man who is most of all responsible for taking us to the World Cup, not Susic, and for him to be treated this way is truly unacceptable. Baffling. Just baffling. Instead of doing his best to lift everyone’s spirits, he has already announced two new defeats, for games we haven’t even played yet. He has already planted the idea that we will, and probably should, lose the last two friendlies before our first World Cup. He’s not worried though. After every setback Susic assures us and comforts us, tells us everything will be okay, because according to him, he “learns from every loss”. He’s been saying this for years and yet we are still losing winnable games because of the same mistakes. How long exactly does it take him to “learn”? Many of us are quite seriously beginning to question Susic’s intelligence. One fan called him “the Sarah Palin of coaches”. Sadly, this could not be more accurate. I am not trying to be mean spirited; I am simply stating the cold hard truth that this man might not have the heart or the brains for this job. If he still wants to prove that he is in fact the right man to lead us, he needs to make drastic changes and soon. It’s time to get serious. We’re only a few months away from Brazil. We do not need to be humiliated in our first major tournament. Change the formation to the more manageable 4-2-3-1 or 4-5-1 and put an end to this unorganized circus we saw against Egypt and Argentina. Two strikers against top teams is suicide. It barely worked against Lithuania, it’s not going to work against Nigeria and Argentina. Leave one striker on the bench so we actually have someone to bring on when we need to, and so both of our strikers aren’t exhausted throughout the entire tournament. Call up Muhamed Besic. He is the only player who has shown real quality in the defensive midfield position for us. Taking Besic to the World Cup would not only make this team better and more balanced but it would also help his career. This is important because talented youngsters like him are the future of Bosnian football. Same goes for Sanjin Prcic. Stop making counterproductive statements that weaken us mentally and ensure our defeat before we even step out onto the pitch. Instill real discipline and a fighting spirit into our squad. Give them vision and the belief that they can beat anyone, no matter how unlikely. Study our opponents like any real coach would. Fans never want to hear their coach say “we didn’t know enough about our opponents”. This is your job. Your job is to spend every moment pondering every detail, no matter how small, that can increase our chances of successes. This entry was posted in Bosnia-Herzegovina National Team and tagged Anel Hadzic, Edin Dzeko, Egypt, Muhamed Besic, Safet Susic, Tino-Sven Susic. Bookmark the permalink. Vranješ se vratio, i to je po meni za odbranu najvažniji dobitak uz Kolašinca. Največa negativnost je činjenica koju ne smiješ zucnuti, a koju treba priznati – Bičakčić nije štopr kalibra Lovrena, Nastasića, Savića, ili nekih koji igraju u njegovoj Bundesligi za malo veče klubove. To ne znači da se neče razviti u velikog štopera, ali u ovom momentu on je najbolje što imamo ili možda i nije ! Pošto ti preferiraš Bešića, a on već skoro dvije sezone igra gotovo isključivo štopera, možda bi Bešić bio puno bolja opcija naštoperu od Bičekčića, koji by the way, ima još dosta pure da pojede da bi bio vrhunski štoper – kao prvo se mora dokazati da je prerastao svoj klub koji je već ispao u 2. Bundesligu ! Sve najbolje, Ljuti, i još jednom čestitke na odličnom tekstu ! Jesam procitao tvoj tekst, i takodje je bio odlican. Imamo slicne ideje. Upravu si Besic je bolji stoper od Bicakcica, ali ako ga stavimo na tu poziciju, ponovo nemamo defanzivnog veznog. Onda ako stavimo Kolasinca u vezni red, onda nemamo LB. Bicakcic zna ponekad biti dobar, ponekad los, zavisi. Mislim kad bi imali pravu organizaciju, dobru taktiku, defanzivnog veznog kao Besica….onda bi i Bico izgledao dobro pored Spahica. Ja sam zaboravio na mogućnost da dobijemo Dinu. S tim u vezi ova tvoja formacija skupa sa rezervama je baš perfektna. Ali tek da i ja nešto dodam, diskusije radi, ja bih Tinu kao ofanzivnog, koji stoji “duboko”, od sada držao među 23, ustvari on bi mogao biti zamjena za Medu, dok bi Kolašinac-Salihoović-Lulić bili lijeva strana pa ko je spremniji (zanimljivo i opasno je to što sva trojica imaju isti problem s koljenom, a Sejo sa oba). I još bih im pridodao Maria Vrančića i Salatića – fudbalski, Salatić je beton – obojica su u velikoj formi i oko njih se u njihovim sredinama diže velika prašina …. Armin Hodzic just made the world take notice – Will Liverpool regret letting him go? Copyright © Angry Bosnian Fan 2014. Unauthorized use and/or duplication of this material without express and written permission from this blog’s author and/or owner is strictly prohibited. Excerpts and links may be used, provided that full and clear credit is given to Angry Bosnian Fan with appropriate and specific direction to the original content.